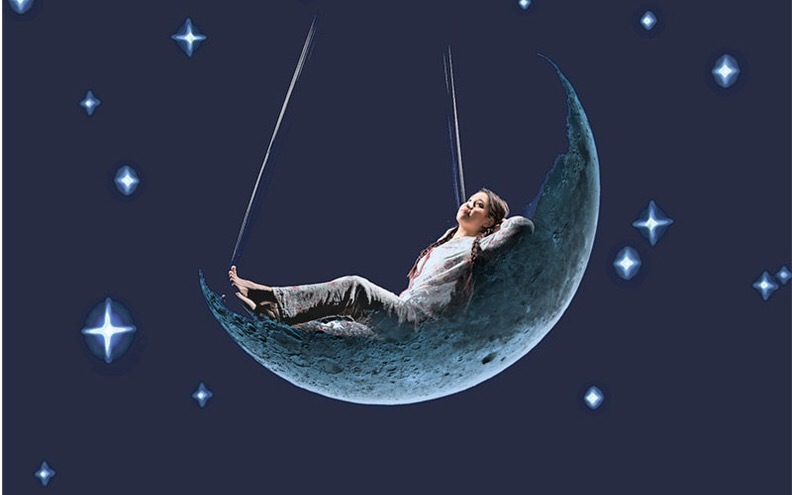 This immersive production is filled with laughter, excitement and wonder as you watch tucked up in the comfort of beds, cushions and blankets. Within this production there is unique ability to cuddle up, get comfy and enjoy from a very relatable sense of setting. Upswing in partnership with Stratford Circus Arts Centre, present an experience of circus, projections, storytelling and physical theatre in the comfort of feeling at home. Hazel Lam, otherwise titled ‘the little girl’ engages and amuses with her fun loving notion of creativity, dance and self-expression. She engages audience members to journey with her throughout her quest, encouraging responses of encouragement, strength and commitment. Nathan Johnston, who plays the role of ‘Three’, the little girl’s imaginary friend, is poetic in movement and captivating to watch. The two roles reflect a sense of positive relationship with a pure essence of connectivity and togetherness. Lastly, Lewis Barfoot known as ‘Mum’, offers a heightened interpretation of a single working mum, who strives for both a working career and parental role. This production is entirely immersive with each audience member engaging with the story in a relatable yet imaginary way. Watching this production, it becomes evident that aesthetically this performance is inspiring, stimulating and moving, however, there are often many holes presented within the storyline and many misguided connections of development. It is also prevalent that there is a real focus on the representation of a working mother and this often comes across as judgmental, and not realistic. However, the production is beautifully presented, with Upswing using the dramatic device of projection that highlights many of the key moments of adventure and storytelling. This is enlightening to watch, and gives a tingle within all senses of the imagination. As Bedtime Stories is a show about interaction, childhood experiences and imagination the atmosphere is highly jovial, fun and upbeat. Within the production there is a connotation of a multitude of themes which include love, self-development and growth. These are all explored within just 50 minutes of action, whilst giving the audience a real delight of circus tricks, creative projection and physical theatre, which goes beyond the norm. Whilst watching the production it is evident that there is a real sense of care and thought for all audience members, presenting a real sense of enjoyment for both adults and children. Within the production there is an essence of inclusivity for all, with parents also entering into the journey and therefore immersive experience.